Geneva, October 30, 2018 -- With a focused feature set and compact package options, STMicroelectronics’ STM32L412 and STM32L422 microcontrollers (MCUs) bring ultra-low power technologies and high performance to budget-conscious consumer, industrial, and medical applications. Whether the squeeze is on core performance, energy, physical space, or bill of materials, the new MCUs give more freedom to beat the constraints. Combining economical 64Kbyte or 128Kbyte Flash density with features such as ST’s FlexPowerControl (FPC), and the 80MHz Arm® Cortex®-M4 core, they set best-in-class EEMBC® benchmarks for efficiency and performance: 273 CoreMark® provides for speedy execution in devices like smart sensors or consumer wearables, while 167 ULPMark™-PP (Peripheral Profile) and 447 ULPMark-CP (Core Profile) demonstrate category-leading energy management. 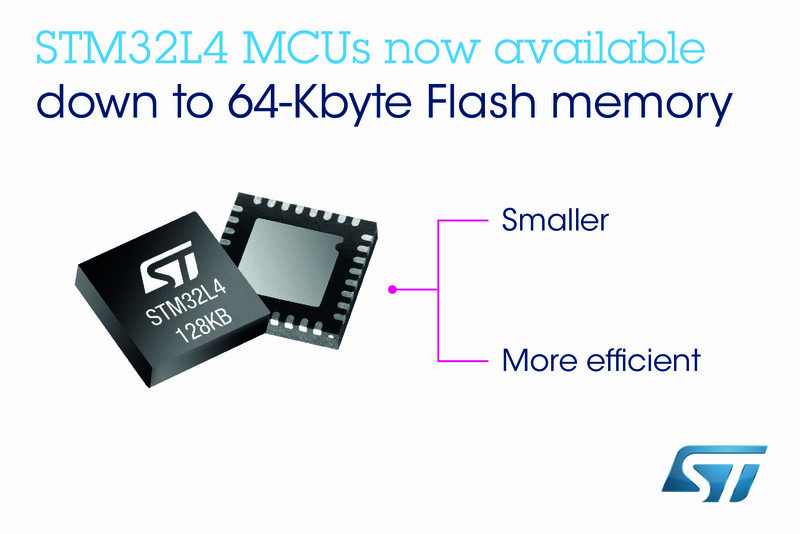 Please visit www.st.com/stm32l4x2 for further information.